Your Sports Consistency with a Proven Pregame Formula! 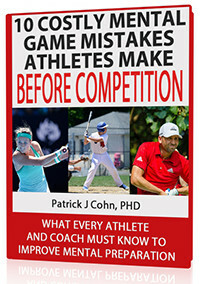 I’m master mental game coach Dr. Patrick Cohn. I want to share with you powerful mental strategies to help you overcome pregame anxiety and perform your best in competition. These mental strategies are not new because I have used them successfully to help my students reach peak performance for almost 20 years. What’s unique is a new formula or system I have developed to teach every athlete and performer how to implement and apply powerful pregame mental strategies. But allow me to set the stage with four very important questions about your mental game…. Do you get so tight or tense before competition that you can’t think straight or have freedom of movement? Do you have trouble sleeping the night before competition, can’t eat before you compete, or are so anxious and tense stepping onto the field, court, course, or track that you are already tired or spent before competition starts? If you said “yes,” you’re not alone! Many athletes experience feelings of pregame anxiety and tension. Pregame anxiety is the number one obstacle to a relaxed and effortless performance – a quality that you must have to enter the zone! **Note: your pregame anxiety or tension will directly impact your amount of success in sports. As a sports psychology expert for many top athletes in the world including NASCAR and PGA Tour champions, I know that the two biggest obstacles to reaching your potential are pregame anxiety and excess tension. Many athletes don’t even consider the importance of a mental pregame routine. Having a physical warm up is the easy part or preparing yourself to play. But you must have a pregame mental routine that helps you relax, focus, and be confident for competition. For the last two decades, I’ve been working with athletes and helping them optimize their mental game strength by teaching them the secrets of top performing athletes and what I know works. mental preparation for a poised and relaxed performance! The ability to relax and play your game under pressure is what separates the winner from the loser in any competition. Champion athletes train hard in practice, are motivated for the right reasons, and are able to raise their game in crunch-time with two minutes remaining in the game..
pregame anxiety and mentally prepare for competition consistently? Working with top level athletes for almost 20 years, I have learned that more practice and effort does not translate into a relaxed and free performance! A relaxed and confident performance begins in the mind! When you are mentally prepared to compete, you can have an optimal level of intensity AND poise! In the above scenarios, each athlete under performs due to anxiety, worry, or fear of disappointing others. If you identify with these scenarios, your tension – or mind cramps – due to anxiety – will cause you to tighten up and lose freedom or movement and trust. To get the most out of your skills and your practice time, you must learn how to prepare yourself for a relaxed and effortless performance. These are actual success stories from athletes and coaches who have used my Confident Athlete Series Programs. A winning mindset is possible when you accept that changes must be made and then take positive action! Feel poised and relaxed about an upcoming competition? Have more fun with your sport by being more relaxed? Break through your fears and perform up to your potential more often? Or enjoy competing because you are not a bundle of nerves or afraid to make mistakes? Know you can perform well even when you feel pregame jitters? Working with some of the top athletes in the world including PGA Tour winners and NASCAR winners on techniques to improve confidence, focus, and composure for sports – over 15 years. Owning and operating the world’s leading mental training web site with over 20,000 readers and hundreds of current members who are reaping the rewards mental game coaching brings to their performance. help my students perform with poise and relaxation. With my step-by-step practical CD/Workbook program, you can quickly learn and immediately APPLY the key mental game strategies to overcome pregame anxiety and develop a pregame routine to enter the game with confidence. I teach to my one-on-one mental coaching students. My new system in The Confident Athlete CD/Workbook series is a ground-breaking program to help you overcome pregame jitters, performance anxiety, and a lack of pregame confidence. I deliver this new program based on my readers feedback and comments from athletes who have already used The Confident Athlete programs with huge success! My new program walks you through, step-by-step, using a practical workbook. And the best part – you only need 15 minutes a day! The Relaxed Athlete program is ideal for any athlete that wants to overcome pregame anxiety, worry, or excess tension and learn to perform with poise. It’s also ideal for any coach or parent who wants to teach athletes to perform with poise and relaxation in competition. “The Relaxed Athlete” program is presented on two 78-minute CD’s with a 73-page step-by-step workbook. I combine a practical and real-life workbook with a step-by-step CD program that takes you through each day of the 14 day program. It’s like having your own personal mental coach on your iPod or stereo. You can use these CDs at home with the practical workbook or download them onto your iPod so you can listen to them in your car or van repeatedly until the strategies are stored in your sub-conscious mind. Want A Sneak Peek? Download my FREE Report…. What’s in the “The Relaxed Athlete” Program? A 14-Day Plan for Optimal Mental Preparation – below. in this 14-day step-by-step workbook program! An introduction to get you ready for the upcoming daily exercise. The objective of each “Daily Relaxed Athlete Strategy”. The primary task you will need to complete, practice, and apply. A short relaxation, guided imagery, and daily mottos or affirmations. Action plans to help you put the plan into play and apply it to your sport. Specific drills or mental game exercises for applying the daily task to practice and competition..
“The Relaxed Athlete” was developed for any level coach, parent, or junior to professional athlete who wants to learn how to have a relaxed performance. It does not matter if you are a fledgling junior athlete or a seasoned professional plagued with anxiety, or you just want to learn how to teach others my secrets to developing a focused and confident pregame routine, “The Relaxed Athlete” is the cream of the crop in “The Confident Athlete” Series CD Programs. I know for a fact that the strategies I teach you in “The Relaxed Athlete” work because I have used these same mental game strategies successfully with my students for almost 20 years! If you have any reservations about the appropriateness of my program for a young or junior athlete, don’t worry. You can sample the program and return it if you find that your athlete is too young or not mature enough to apply the principles – for a full refund! However, we recommend parents work through the program with children aged 12 or younger. I love to work with athletes, one-on-one, and am happy to help you with a personal coaching program. But working with me in person isn’t within everyone’s budget ($1500.00 per day). That’s why I created “The Relaxed Athlete” Program, so that anyone can have access to powerful mental toughness strategies I use when working with athletes one-on-one! and perform consistently with freedom and poise. What would it be worth to you – to enjoy your sport again and learn how to perform better in the big games? You can, of course, try to work harder or try harder in competition and hope that your worries disappear. A better option is to be proactive with your mental game by learning mental strategies that have worked for my personal students, for a fraction of the cost of what they pay me. You can own your personal copy of “The Relaxed Athlete” today at a special introductory offer price of only $99.00 $89.00 (plus shipping). This special program with premium bonuses is worth at least $199 retail, but as a devoted peaksports.com reader, I am offering it to you at more than 50% off retail price! you can save 30% on all program! We only produced a limited number of copies in the first printing and I’m certain these will sell really fast just like the others programs in The Confident Athlete Series. 2 CDs packed with poise-boosting strategies that you can enjoy many times and download to your iPod so you have a refresher course once a month. A 73-page workbook to help you learn, practice and apply my mental game strategies, and individualize the exercises to your needs. 14 days of unique exercises and actions plans to commit to each strategy and help you take action immediately. A daily exercise to assess your progress and test how well you are engaging with the actions plans. Four additional peak performance bonuses (see below) that make this purchase a no-brainer – packed with value. A $135 Value – Download Immediately! Special Bonus #1 – A Self-Respect Letter! A form letter on a Word or PDF document that you can modify for your sport and situation. This letter helps you accept yourself unconditionally without regard to success or achievement in sports. Bonus value: $15.00. Special Bonus #2 – Post-Performance Assessment! “The Relaxed Athlete” post-performance assessment helps you assess your pregame and competitive attitude after your performance. You’ll want this bonus to help you identify weaker parts of your pregame attitude and continue to stay on top of your mental training for relaxation. Bonus value: $15.00. Special Bonus #3 – Sports-Specific Pregame Routines! Get a custom pregame routine guide for your sport! Yes, that’s right, a custom pregame routine that you can then modify further for your preferences. We currently have available golf, tennis, triathlon, hockey, motocross, ice skating, and softball pre-competition routines. You can modify these further based on your needs. Don’t see your sport listed here? You can contact us and we’ll work with you to develop a custom pre-competition routine guide! This bonus alone is worth the cost of the program! Bonus value: $70.00. Are You A Peaksports Network Member? Are you a peaksports.com Member? Peaksports members are entitled to 30% off the low regular price of $89.00 – only $62.00 – that’s a huge savings of $27.00! Not a member yet of the world’s most advanced online mental training system? It’s time to join the winning team of athletes who recognize the value of ongoing, continuing education and performance boosting techniques! Gain access to cutting edge mental training tools including 28 hours of recorded mental training classes, 6 hours of live teleclasses per year, download six sports psychology e-books, access over 500 pages of performance-boosting articles and programs, take the AMAQ online mental toughness assessment, download mental imagery programs, and much more! on Any CD Program in the Confident Athlete Series! NOTE: Please become a member first and then order “The Relaxed Athlete” to get the discount. Use this link to purchase the program at member pricing. I stand by my work and reputation as a leading mental game coaching professional. If you are not completely satisfied with “The Relaxed Athlete” program, you can return the CDs and workbook (within 30 days) for a full refund (less shipping cost), no questions asked! * And you can keep the special bonuses to boot! *Guarantee applies only to a single purchase of “The Relaxed Athlete” Program. This offer is not valid with purchase of any of the package offers or if you have previously purchased a one of The Confident Athlete programs. Why? Because you already know these program work! What are you waiting for? Grab your copy today of my proven, real-life tested CD program, available to you at this low introductory price. 1. The easiest and most efficient way is to place your order online today and immediately download your two bonuses within seconds after you complete your order. Click Here to Order Now. 2. Call toll free 888-742-7225 and place your order with a valid credit card. Have your email, address, phone number, and credit card handy. Coaches: If you want every member of your team to get a personal copy, email or call us for a special team rate. Tell us the number of athletes you have on your team. Thank you for taking the time to read about my latest program, “The Relaxed Athlete” – the best investment you might ever make to overcome pregame anxiety, learn to develop a focused pregame routine, and perform with poise. I look forward to helping you reach your athletic goals with more pregame confidence, focus, and poise. P.S. You can learn the same tension-busting and pregame routine strategies I teach my personal coaching students for a fraction of the price. In “The Relaxed Athlete,” you get a step-by-step, proven system for creating optimal mental preparation contained on the 2 CDs and a copy of a 73 page workbook shipped to your door step. Plus, you get my three special peak performance bonuses all for the small investment of $89.00. Order today – Guaranteed to turn you into a Relaxed Athlete and improve your pregame mental preparation! P.P.S. Become a member of Peaksports Network today and receive 30% off The Confident Athlete Series and immediately download six mental training e-books. Click here to demo Peaksports membership program.